Graffiti and the various elements of street art decorate almost every city of the world. And while somewhere street art does not exceed the level of teenage hooliganism, in other cases, street art is more similar to real masterpieces and even recognized landmark. Anyway, street art in our time is very common and of great importance, as a form of modern art. Erriadh – one of the oldest villages in Tunisia, here Jews, Muslims and Christians have lived together for centuries. The villagers – ordinary people, whose way of life is no different from thousands of other towns and villages. However, after a team of more than 150 graffiti artists from 30 countries visited it, the village has changed radically. Undoubtedly, art has changed life there. In fact, now Erriadh is an open air museum, and one of very popular tourist destinations. 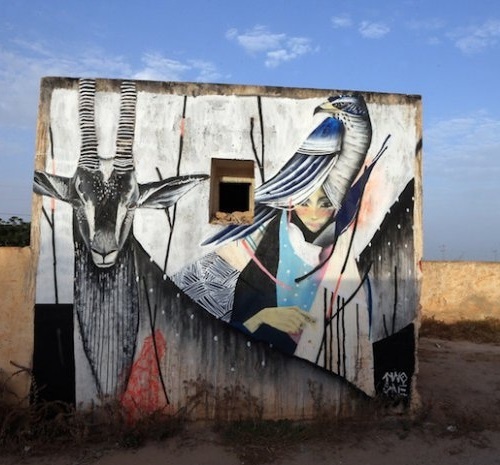 The street art project “Djerbahood”, curated by Tunisian-French artist Mehdi Ben Cheikh began in July-August 2014. Russian artist Rustam Salemgarayev, known under his nickname Rustam Kubic, or Qbic is from the city of Kazan. The famous street artist has just finished a new 9-storey mural in Nizhny Novgorod for the art festival “New City”. 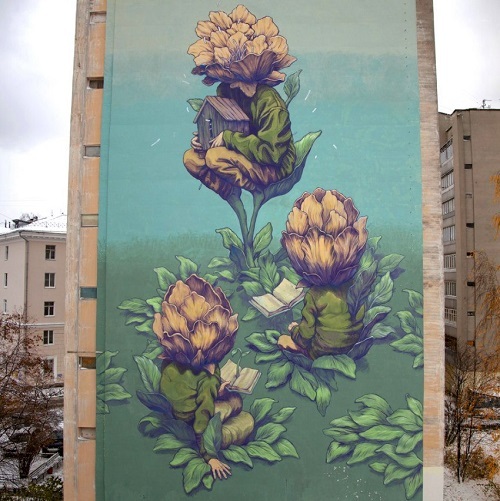 The large scale mural called “Blossom”, is just one of many surreal paintings and murals created by street artist Qbic. New York based street artist London O’Donnell, better known as London Kaye, shares her positive energy through the cute world of knitted cartoon-like characters. Her favorite character, which she knits most often is a classical adorable and cute ballerina. In fact, it is a kind of self-portrait of the beautiful street artist London Kaye, who is a trained dancer herself. She even got a dance scholarship, that allowed her to enter the New York University. According to London Kaye, she has enjoyed crocheting since the age of thirteen. Her passion for Ballet and crochet naturally led London Kaye to the Art world, even though it is a street art. Passing by crocheted with ballerinas, aliens and unicorns fences, passersby gets aesthetic pleasure and good mood at least for a day. 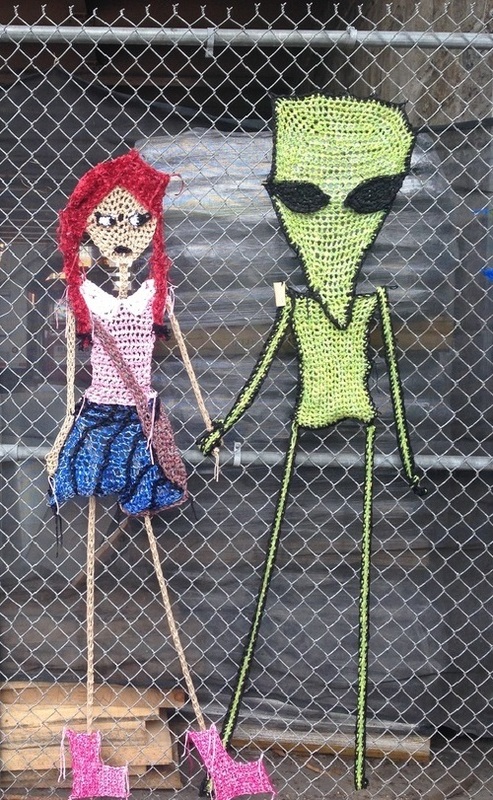 Meanwhile, the planet Earth becomes gradually invaded by yarn-bombers, like London Kaye, and we don’t mind. 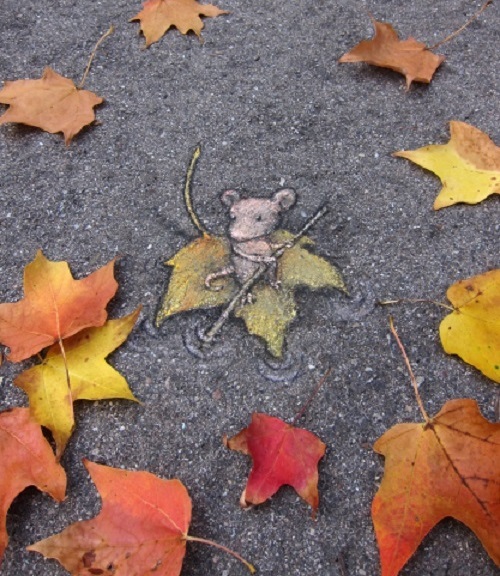 Self-taught street artist David Zinn draws nice and cute creatures on the walls and pavements, uplifting passers-by. The artworks performed in a simple technique, but look very lively and realistic. These small windows into the fairy-tale world make urban spaces more positive and comfortable. Despite the fact that David Zinn never studied fine art, he creates moving pictures, instantly eye-catching. The author skillfully works with the prospect, so that men and animals in his works appear three-dimensional. Funny street art fascinates with its dynamics – all the characters involved in drawing are doing some action. First of all, moss graffiti – a new direction of art and it looks like it has a future. Environmentally friendly picture will just grow on the wall. 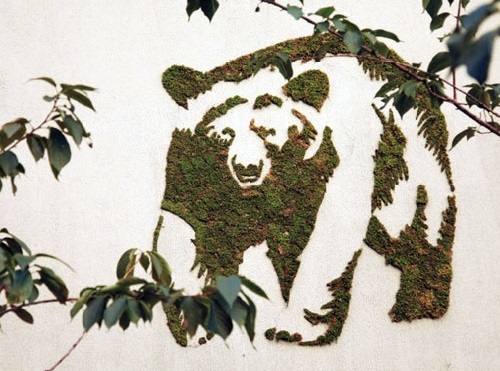 The author of these beautiful moss installations of animal figures appeared on the city buildings – a talented Hungarian artist Edina Tokodi. The “living pictures” camouflage outgrowths, attracting locals and visitors. According to Edina, her idea was simple – to show the relationship between man and nature. Meanwhile, such art has become in high demand, and the use of this technology over the last few years is growing. In addition to written “green poem” in London, street artists created numerous wall paintings in New York and Chicago. In fact, moss is a beautiful living material for decorating anything. Even if your garden is in the average square-cluster dacha, or a modest corner of the courtyard of the city, you still have chances. The chances to make a piece of art, like a backdrop for a romantic medieval history. New York based artist Joe Mangrum studied painting at The School of the Art Institute of Chicago. The art portfolio of Joe Mangrum consists of installations, paintings, prints and sculpture. 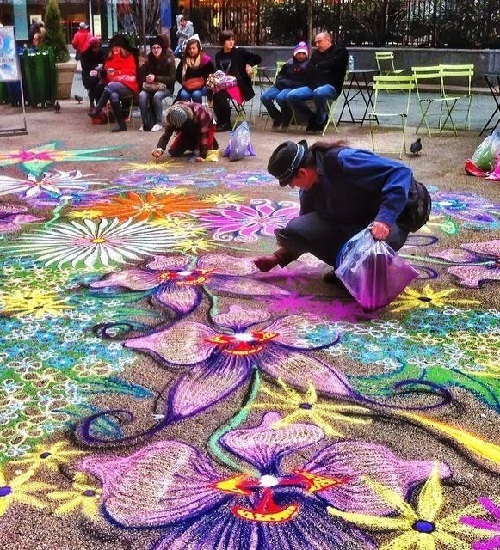 However, Joe Mangrum became best known for his colorful sand mandalas. According to Joe Mangrum, he first picked up colored sand as a medium in 2006. Meanwhile, he turned his kaleidoscopic images into a 4 dimensional painting, interacting with viewers. And now, handsome and talented street artist exhibits his artworks worldwide. In particular, in Red Gate Gallery in Beijing, Museum of Arts and Design in NYC, Natural World Museum in Copenhagen, de Young Museum of San Francisco, The Corcoran Gallery Rotunda in Washington DC, etc. Noteworthy, he has created more than 500 public sand-paintings since 2009. 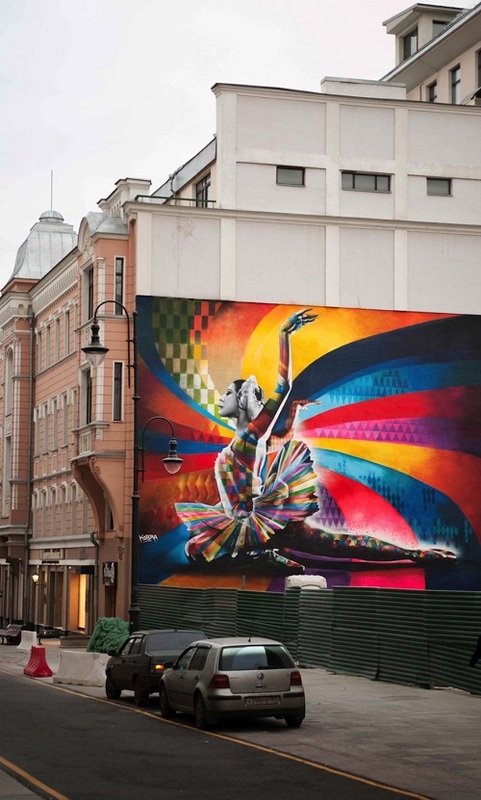 Whether traveling to New York, Moscow, or Sao Paulo, you will definitely recognize the art of a famous Brazilian street artist Eduardo Kobra. He can’t be confused with anybody else – his huge wall murals are a kaleidoscope of colors, manifestation of blue, red, yellow … Eduardo Kobra was born in 1976 in Sao Paulo. His artistic talent was noticed in 1987, first on the outskirts of Sao Paulo, and soon in the city. Following the developments that urban art has gained in Sao Paulo, he develops the “Walls of Memory” project that seeks to transform the urban landscape through art and redeem the memory of the city. This project is an amalgamation of nostalgia and modernity, resulting in scenographic paintings, some monumental, recreating nostalgic moments of the city.